Sun-dried fruit nourished the American pioneers through their long winters. In Little House on the Prairie, while the blackberries are ripe, Laura and Ma pick buckets of them daily in the creek bottoms. Ma spreads them in the sunshine to dry. We had never dried berries before. However, we have dried apples. 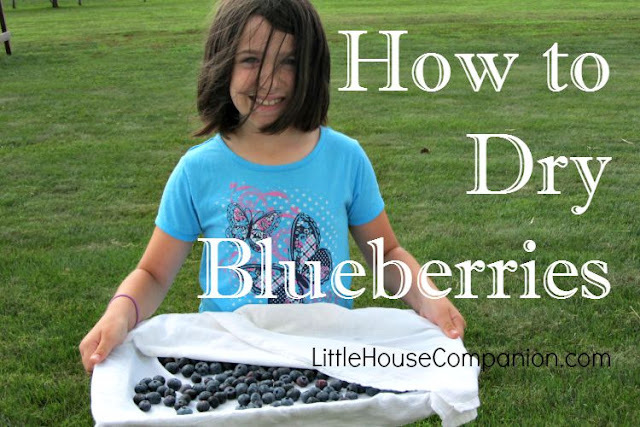 So when my 8-year-old daughter asked if we could dry blueberries, how could I resist? Using Ma's method as a starting point, we lined a cookie sheet (for easy moving) with cheesecloth. Then, we placed the blueberries on the cheesecloth and covered them. The cheesecloth protects the blueberries from bugs. Next we placed the blueberries in direct sunlight hoping for sun-dried blueberries. In the late evening, we brought the blueberries indoors so dew would not cover them and returned them to the sun in the morning. I knew it would take at least several days to dry the blueberries. However, on day 4, they were still big, round, and juicy. Our days had been extremely humid and I suspect the humidity prevented the blueberries from drying more effectively. I decided to use the oven to dry the blueberries before they went bad. I removed the cheesecloth and baked the blueberries at 200° for many hours. I checked on the drying blueberries every two hours. When the blueberries were no longer juicy when squeezed, they are ready to be removed them from the oven. Baking times will need to be adjusted based on the size of the blueberries and their moisture content. The dried blueberries tasted a lot like raisins. 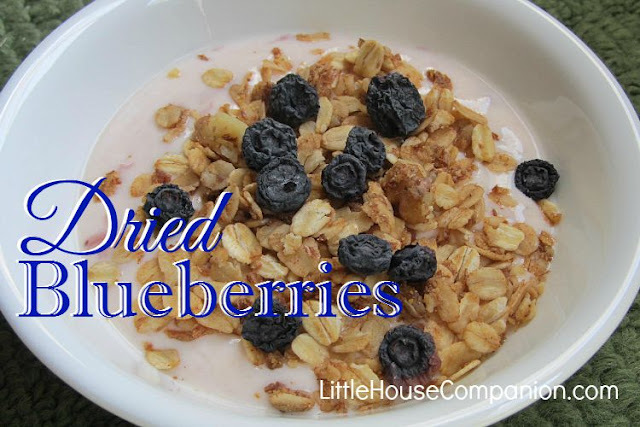 The children especially enjoyed them mixed with yogurt and granola. If you haven't done so, check out how to dry apples (it's easy) and our other pioneer recipes.